Description: Contemporary gospel at it's best! Biography: Curtis Mayfield III is an extraordinary songwriter as well as skilled record producer. Curtis is the son of R&B legend Curtis Mayfield and you can hear that the apple doesn’t fall far from the tree. From Curtis’ thought provoking lyrics in tunes like “Just Being Me” to the lush arrangement of “What If?” he has lived and learned with one of the best and most recognized producer / songwriters of our time in his father. "CIII" as he is affectionately referred to in the music world was born August 10th in Chicago, Illinois. Curtis is an exciting and extremely talented musician that plays over 13 instruments fluently. This includes all woodwind instruments from Flutes to Clarinet and Oboe to Keyboards and Guitar. At an early age Curtis joined his grade school band and immediately began to explore his musical creativity which never seemed to have any boundaries. He quickly rose to become one of the most renowned classical soloist in Illinois youth orchestra competitions bringing home first place medals in several competitions. In High School Curtis was able to branch out into Jazz music and studied under what many believe to be the best High School music director in the country, Mr. David Eanes. It was under Eanes tutalage that Curtis began to grow musically and as a leader amongst his peers. Curtis quickly became a McDonalds All-American musician and was listed in Who’s Who in Music when he was only a sophomore. Curtis went on to earn numerous awards both as a soloist and leader in his band. By the time Curtis left High School he had already played several shows with his father, Lionel Hampton, Bunky Green, and many other notable artists. It was only after moving to Atlanta and spending even more time in the studio working with his dad on his Honesty Album that Curtis realized in what direction he would focus musically. For it was during this time that Curtis realized that he had the gift of being able to put together a record from beginning to end. Since then Curtis has been on a mission to become one of today’s most respected record producer / songwriters. After spending time with his father Curtis returned to his roots in Illinois and began recording local acts that have gone on to become very successful. Side by Side, Wanda Rogers are 2 acts that come to mind that have been extremely successful and have benefited from Curtis’ songwriting and production skill. Curtis has also done several voiceovers for major corporations as well as written jingles for both Radio and TV. It was only during a conversation with his wife and David Eanes that the concept of "Just Being Me" began to take hold. So sit back and enjoy the ride! 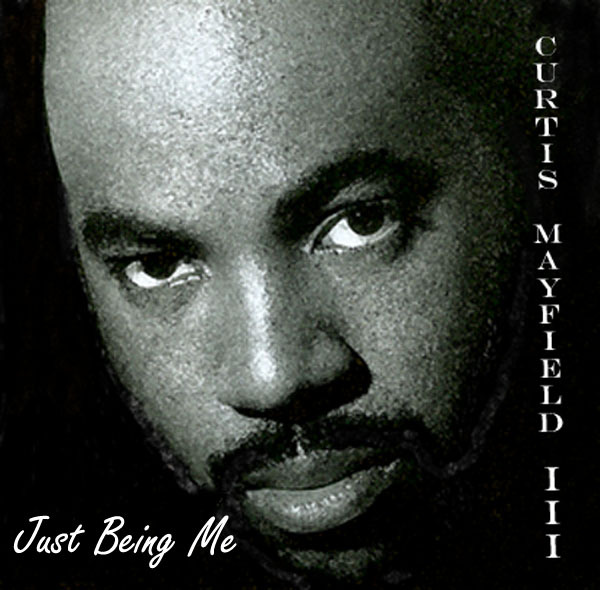 Curtis Mayfield III, son of R&B legend Curtis Mayfield, has just released his first contemporary gospel CD titled “Just Being Me”. It’s new, it’s exciting, and it’s a fresh new sound from this lyrically gifted songwriter / producer. You’ve heard the father-now hear the son.